I have experienced cultural confusion and appreciate reading about how others have dealt with it and what they have gone through. Being cultural confused here in the States isn't necessarily a bad thing, and strangely a topic that was also deeply covered in the book I read directly before this (Black White and Jewish). For me, it was being both white and Hispanic. As if being mixed wasn't confusing enough, there are the great many countries that Hispanics can be from, though we are often confused for each other, and the in-fighting that happens among us. I totally identified with this part of the book since the Middle East can apparently cause the same identity issues. Everyone that you meet can't wait to tell you what your culture is like but you, who are supposedly living it, can't quite figure it out. Yep, that was my childhood too. That said, I loved reading about every moment of Said's confusion over why she couldn't just be like other girls and why she couldn't quite understand who she was supposed to be. I loved that there were so many elements of a typical American childhood mixed in with those differences. I loved the way she talks about feeling like the other mothers loved their daughters more by demanding special dietary concessions while her mother didn't do that. I loved the way she dealt with having to revise her place in the world as the conflicts in the Middle East made different parts of her heritage hard to explain to the New Yorkers around her. More than anything, I loved the way she changed paths and forged a new place for her in her chosen career path. She wasn't going to let people tell her where she belonged, she told them. Okay, she was a part of a group that started in on it and I appreciate that they wouldn't let someone else distort their narrative after 9/11. My only problem is that I didn't totally understand the title. 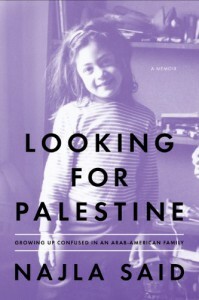 The subtitle makes total sense as you read the book but I kept expecting her to be doing something closer to Palestine or maybe for Palestine. The best I can guess is that she was looking for Palestine within herself because Said is both Palestinian and Lebanese. The Lebanese side she understood earlier. I had seen some discontent with her disconnect with her father's work as a child but kids are not their parents and I would hope that anyone reading the book would see that. Maybe it's again coming off of reading Rebecca Walker's book because it can be so obvious to some and yet other expect some children to relive their parents lives. I found it endearing to hear about how she later figured out that all these people who had been guests in her childhood home turned out to be big movers and shakers in the political world.